Last week was one of the highlights of my working year. I am one of the directors of the CIES International MA in Management, Law and Humanities of Sport, which De Montfort University co-teaches with SDA Bocconi School of Management in Milan, and the University of Neuchâtel in Switzerland. The year-long course, which attracts talented students from around the world culminates in an afternoon of group presentations on the students’ chosen research topics. This year, subjects included Esports, Ethics, the pros and cons of co-hosting mega-events, the Youth Olympic Games, data analytics in sport, and so much more. The full video of the presentations is now available here. 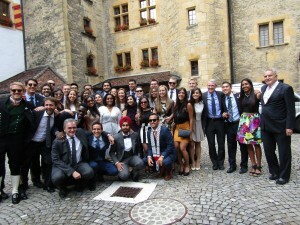 The following day, the students graduated in an inspiring ceremony at Neuchâtel Castle, where guests of honour included Fatma Samoura, Secretary-General of FIFA, and Giovanni Malagò, President of the Italian National Olympic Committee. Congratulations to all of the students involved, and to my colleagues at CIES and the partner universities.